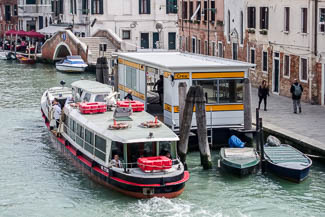 Crea is a single-pontoon ACTV stop on the southern side of the Cannaregio Canal, just below the Tre Archi bridge near the San Giobbe Church. The neighborhood is quiet, and it's a five- to 10-minute walk from the Santa Lucia railroad station. The Guglie stop of Alilaguna's Linea Arancio airport boat is nearby; click here for hotel recommendations. Note: Crea does not have a ticket booth or vending machine, so here's what to do if you need to board a water bus without a valid ACTV ticket or Tourist Travel Card.